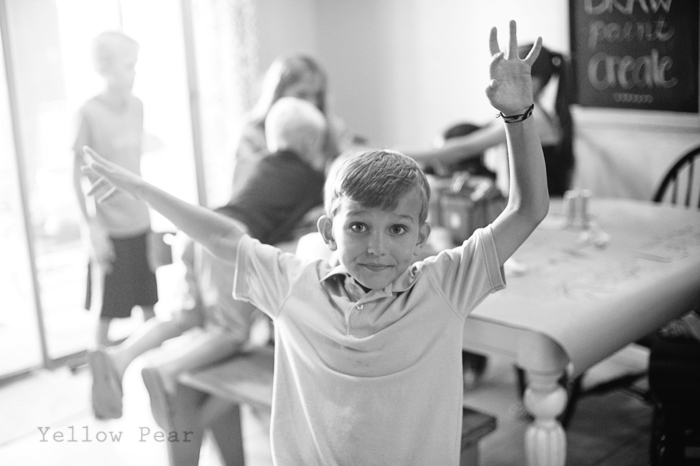 Q turned seven years old. He is an art fanatic so we thought it only fitting to put together a simple art shindig. It turned out swell. And was super simple. For the "cake", I made an edible artist palette. I bought store-bought chocolate chip cookie dough and cooked it on a circle pizza pan. Then I cut out a hole for the artist palette handle and put different colored frosting as paint around the edges. It was sooooo easy and impressive. I wish (kinda) that I had made homemade cookie dough as it would have been a bit thicker, buuuut it came together so quickly that I don't feel too bad about it. 1. 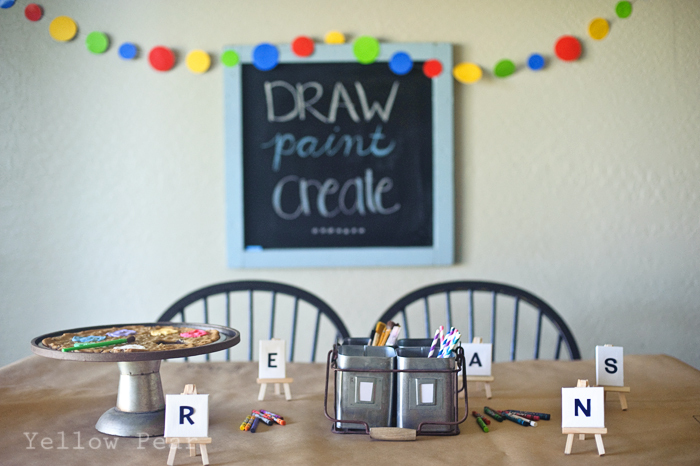 I lined the table with brown kraft paper and let them color while we waited for everyone to arrive. Easiest activity ever and they LOVED it. They could have colored for a lot longer, but I stopped them after about ten minutes to continue with the next thing. 2. 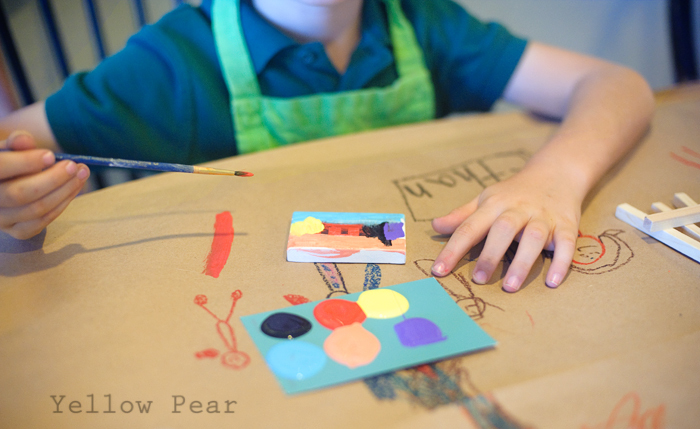 Next we painted mini canvases on tiny easels. We put each kid's initial on a tiny canvas and let them paint around it and then peeled off the sticker when they were finished. 3. Painting rocks was a hit...especially the googly eyes. I love seeing the kids' individual creativity. 4. We decorated cupcakes with sprinkles, different color frosting and gold glitter candy. 5. The funnest activity was probably blowing watery paint all over a paper with straws. Each design turned out so different and the kids loved it. 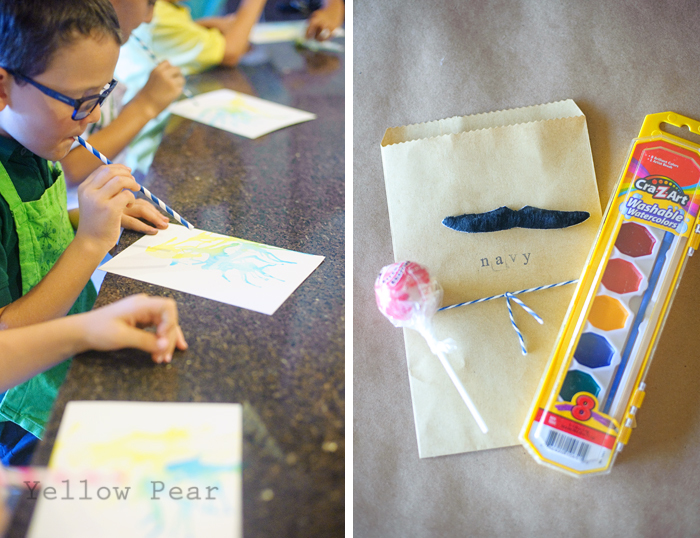 For favors, I sent the kids home with a mustache (for the inner artist in them), a paint set and a colorful sucker. Easy and simple from start to finish...and now my boy's growing up. 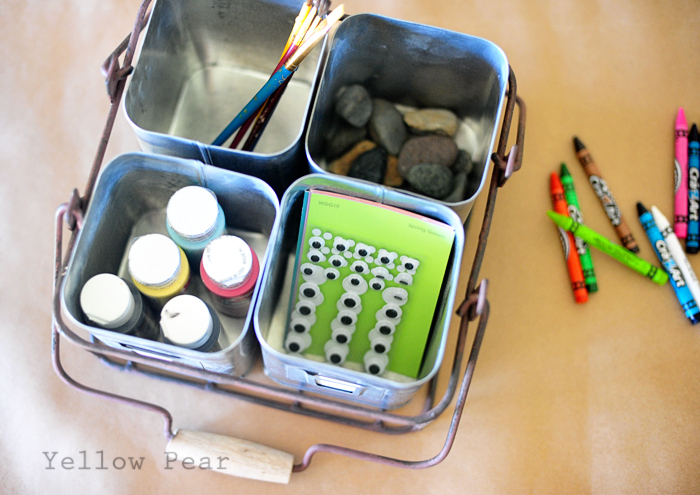 That cookie with frosting on the art palette is a BRILLIANT idea. BRILLIANT! 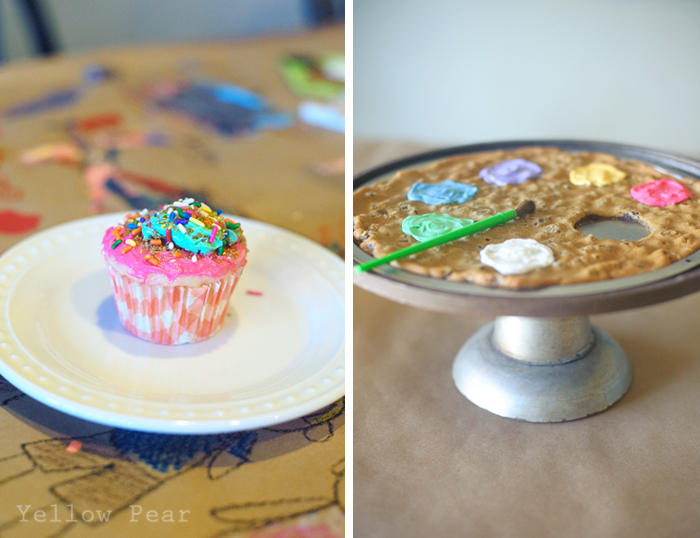 This Simple Art Birthday Party is lovely. I love this idea. It is quite budget friendly party. I really love art parties and also hosted one last year on my son’s 5th birthday at one of the best venues San Francisco. We had blasting time there!